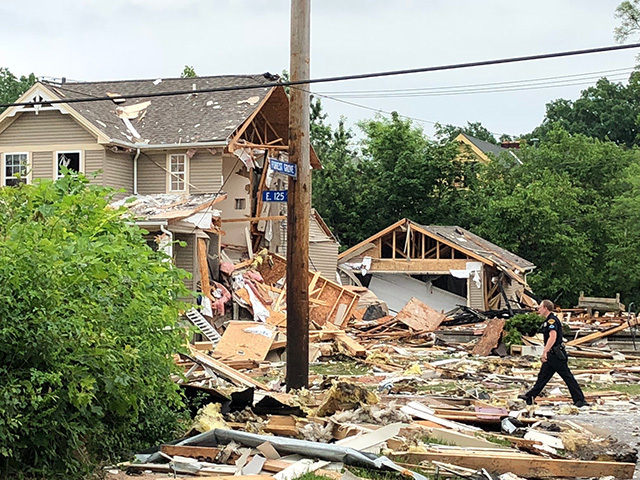 The East Cleveland Fire Department confirmed one female has died and one male has been injured after a house explosion on the border of Cleveland and East Cleveland early Sunday afternoon leveled one home. “You could see her waving and all the neighbors started screaming and waving, ‘Somebody help her, somebody help her! '” said witness Nena Maria Fitzgerald about the woman who died. Fitzgerald said police started to help the woman, then put a sheet over her. “I think they only found like half of her body at the time,” Fitzgerald said. The injured male suffered multiple burn injuries. No firefighters have been injured. Cleveland police and fire arrived at the scene at 1073 E. 125th Street near Forest Grove before the East Cleveland departments and said four houses were on fire. Cleveland EMS also responded. Cleveland police said they were originally called for wires down at the location.